The noise during sewing usually comes from the hook. The “standard domestic” vertical oscillating hook is the most commonly used hook of them all, it was introduced in the late 19th century in Singer model 15. This is an oscillating hook, so the driver swings back and forth, bumping into the hook at the ends, and this is what makes the noise. 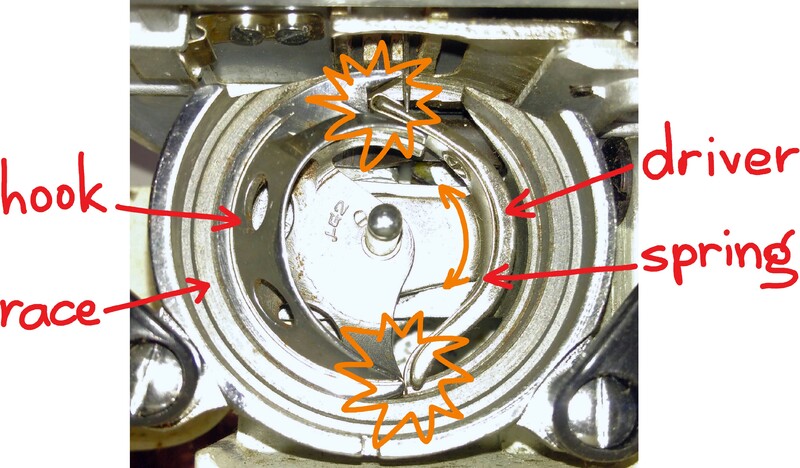 The amount of space between the tip of the driver spring and the hook determines the amount of noise the machine makes. The smaller the space, the less noise is produced. Excessive noise either indicates a problem (hook needs oiling, something is stuck in it, the bobbin doesn’t spin properly, etc. ), or poor quality of manufacture (it is too loose and the shuttle is wobbling about). In both cases things can often be improved! The first thing to do, then, is to see whether there is a problem. Step 1: Clean, polish and oil. Open the hook assembly and remove the hook. You can now clean everything in it and oil the race. Just a drop of oil on the “rail” is enough, but it needs to be done frequently. A good rule of thumb is to oil the race every time you wind a bobbin. Polishing is only required if the surface is not smooth, check both the hook and the race. There could be dirt build-up that is stuck and needs scraping off, or it could have been damaged by debries or by a broken needle as it happened to my Dragonfly. Step 2: Adjust the spring. 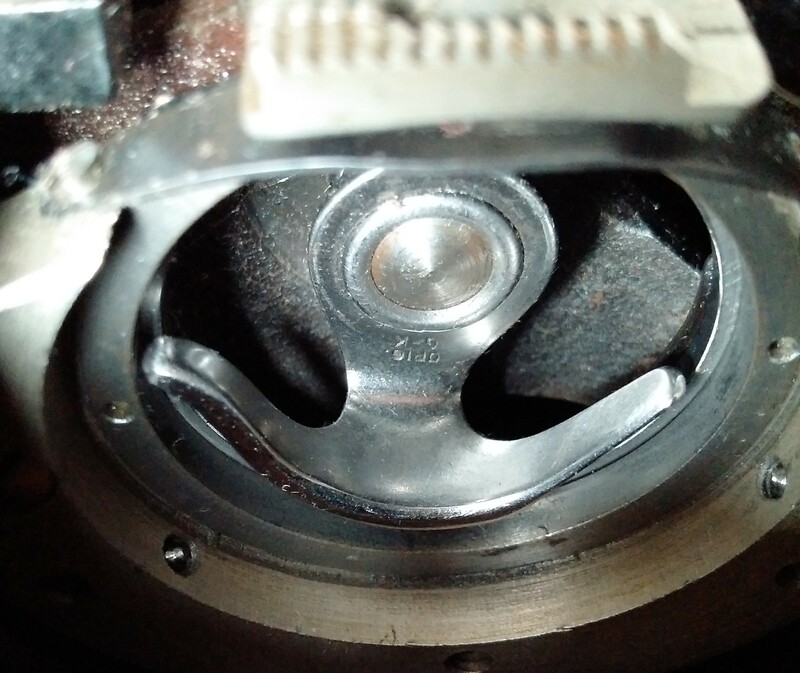 If the hook is still noisy, the driver spring may be too flat. It is held in place by two screws, so if you manage to unscrew them, you can adjust or replace the spring for a tighter fit with the hook. The hook fits quite tightly with that driver, so the machine is not exceptionally noisy. The space between the driver and the hook must be large enough for the upper thread to pass through it. 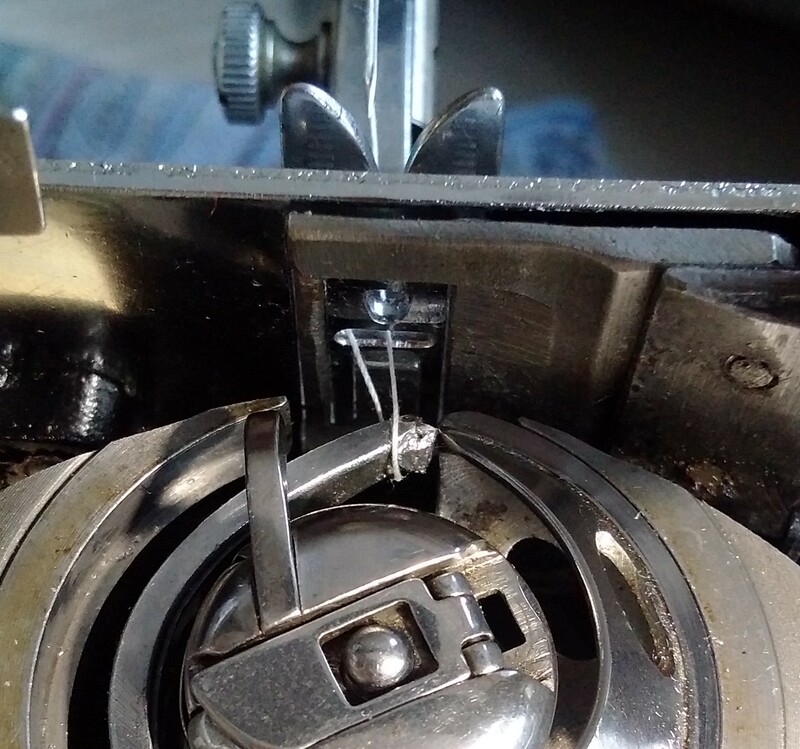 If you want the machine to be able to handle thicker top stitch thread, you have to leave a sizable gap there, and this is where a spring is so beneficial. However, a solid driver certainly works. Step 3: Modify the driver. When my Harris Automatic arrived, it was making a lot of noise during sewing. 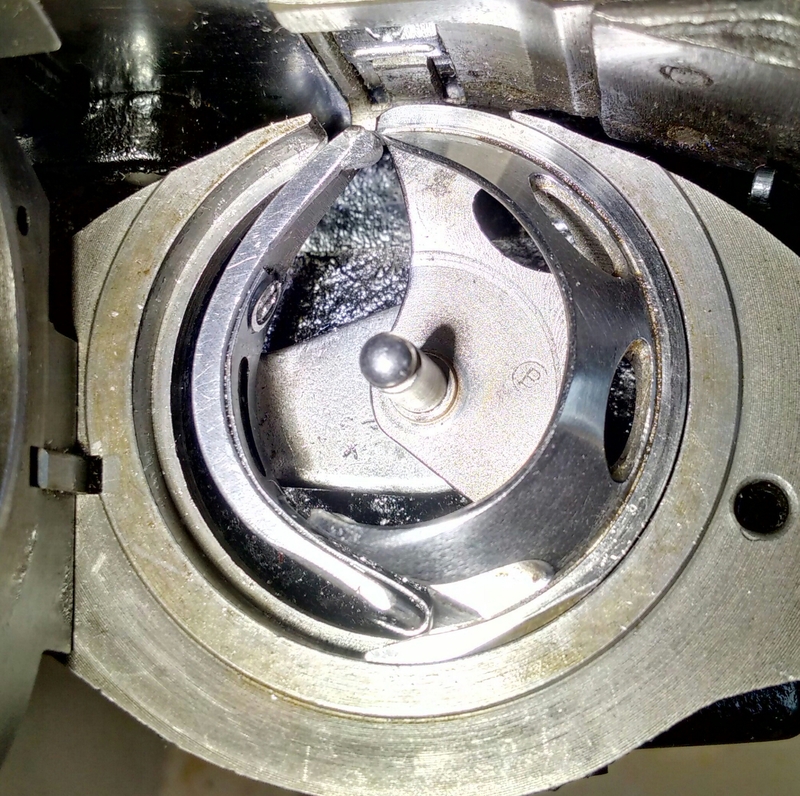 An investigation revealed that the hook driver had a broken spring which made the hook wobble. The obvious course of action was to replace the broken spring, but I could not undo the screws. All I needed was a spacer to fill the gap between the driver and the hook, so I decided to solder some tin onto it. It worked, but had to be filed and polished to a very smooth finish, otherwise the thread was getting caught on it on the way out. 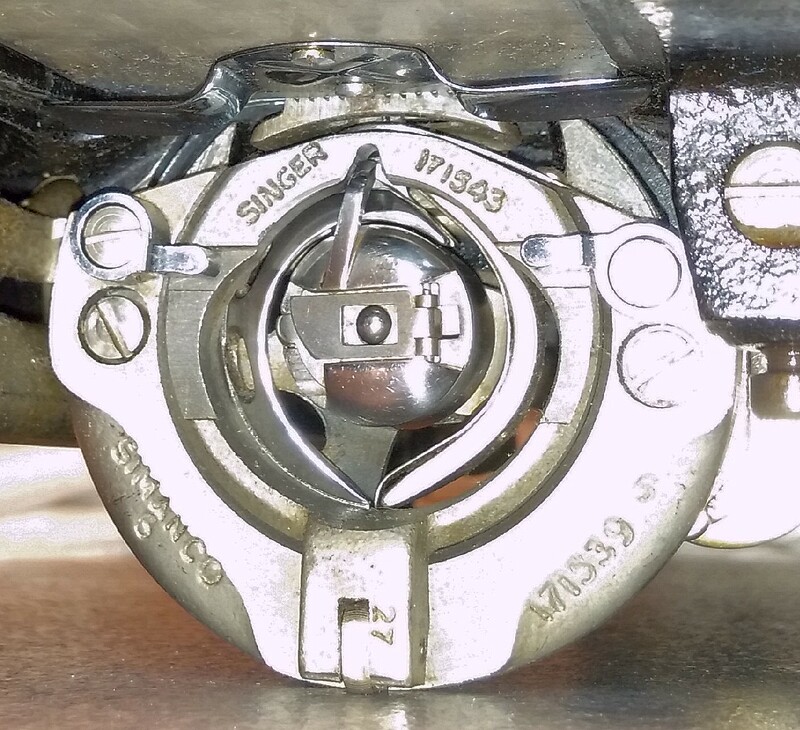 Another idea would be to take a new spring, break it just above the screw hole where Harris’ spring was broken, and solder on the spring tip instead of a solid bump. Might work better, and is certainly something to try. The bottom line is: do whatever is necessary to get your machine sewing again! I’m curious about your comment ‘a 1954 Frister & Rossmann machine made by Vesta’. I take it it is something different to the Vesta machines made by LO Dietrich? I think that company had closed by the 2nd World War anyway, so was there another company called Vesta making Frister & Rossmann machines – did they buy the name? This is all very confusing! See my post on the League of Excellent Solid Machines (https://vintagesewingmachinesblog.wordpress.com/2017/03/12/the-league-of-excellent-solid-machines/) for the photo of that Frister&Rossmann machine. It has a big “V” on the side of the column, and it was made in Germany. But it has “G-K” engraved on all the parts, also visible in the photo of the driver. I assumed that “V” stood for Vesta! According to Sewmuse at http://www.sewmuse.co.uk/german%20sewing%20machines%202.htm, the Frister&Rossmann name was bought by Gritzner, but it was also owned by a London distributor… Go figure! May be Gritzner bought the name Vesta too? And anyway, what does “G-K” stand for? Gritzner-Kohler may be?